Stained concrete is one of the most beautiful flooring options available. When there’s existing carpet on the floor that needs to be removed, there’s usually the problem of what to do with those pesky tack strip holes. As you can tell from the picture on the right, tack strip holes can be quite large. When you’re going from carpet to stained concrete, these holes can appear much larger than they really are. 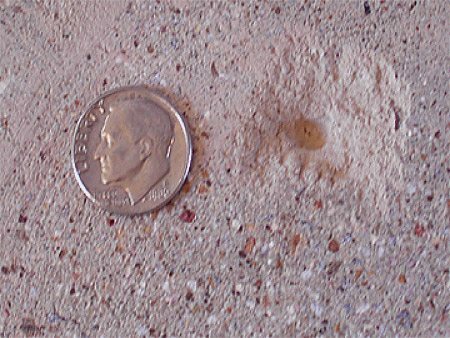 While most tack strip holes are the size of dimes, once you’re concrete is stained, they can stand out so much, you’ll swear they’re the size of a half dollar! For some, the holes just don’t seem to matter. For others though, it’s something that makes the room look a little tacky. Pun intended! So the question remains, should you go ahead and have Glossy Floors stain the floor, leaving the holes unattended, or should you have the Glossy Floors professionals do a complete overlay? What’s the difference? Each concrete floor is different and, as a result, each stained concrete floor will look different after it’s been stained. Leaving the tack strip holes in one floor might not look so bad, while another floor can look absolutely horrible if the tack strip holes aren’t dealt with. There are usually four choices when it comes to dealing with those pesky tack strip holes. Leave the holes alone and see what happens. A concrete overlay that’s stained. Repair the holes and then stain. A much darker border all the way around the room. A stained concrete overlay will allow Glossy Floors to start over with a completely new canvas. It would be almost like starting over with a new concrete floor that we can do just about anything with. We can create patterns, use multiple colors, etc. Having a much darker border will keep the tack strip holes from showing up us much, but you will probably still see them. Experience shows that it will usually come down to price. A stained border is less expensive than a complete overlay. Not a lot less expensive, but less expensive. Give us a call today and let us help turn your existing concrete into a work of art! To see some examples of acid stained concrete, please visit our picture gallery. As always, please feel free to contact us regarding any of your concrete staining questions or to plan your next concrete staining project with Glossy Floors. Be sure to take a look at our stained concrete image gallery. Glossy Floors is the premier concrete contractor for Northwest Arkansas, Tulsa, Oklahoma and Missouri and we want to be your concrete company. We would like to be your concrete staining company! Serving customers from [mygeo_city], [mygeo_region] to Houston, Texas since 1987! We also have a low price guarantee: Show us a written bid from any another concrete company in Northwest Arkansas, Tulsa, Oklahoma or Missouri and we’ll match it!